The photo shown is of a current Home Base Holidays member's Tudor style home outside of Oliver, BC, Canada, near the best of the southern Okanagan Valley's wineries, golf courses and orchards. See the full home exchange offer, HE18776. Read the updated article in full and do check out all the other great information that Travel with a Challenge has to offer. The Summer 2007 issue of 'New Home Locations Scotland' published by The Scotsman included an article on home exchange, 'Find a holiday home from home'. The photo above left is of Laura's family in front of their house in Roslin, Midlothian. See their home exchange offer and more photos, HE16682. 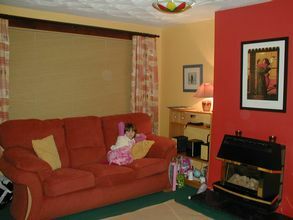 The photo on the right is of Kim's living room in her home in Bishopbriggs, near Glasgow. See Kim's exchange offer and photos, HE14803. 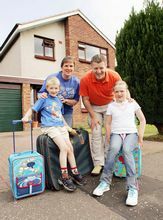 During August 2007 Home Base Holidays has been offering home exchange membership at the reduced rate of £21 (pounds sterling) for one year or £31 for two years. This is a special, one month only, discount offer (a saving of £8 on the regular rates) which will end on 31 August. 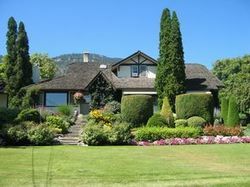 Late summer is a great time to list your home if you are considering a home swap over the Christmas/New Year period or are looking ahead to exchanges next spring or summer. The longer your listing is in circulation before your exchange dates, the greater your choice of offers. Don't delay - join Home Base Holidays today! To check the current rate of exchange between pounds sterling and any other currency, use the Quick Converter at the top of the OANDA Currency Converter site. It is an excellent idea to suggest to members interested in your offer to invite any of their friends, family or colleagues who live in your city or town to come and see your home. Friends who visit will be able to report back on their impressions of your home, and this is bound to be extra reassuring to potential exchange partners, especially first time exchangers who may be a little nervous. 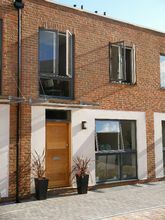 'We live in a newly built mews house in South West London. There are excellent transport links by bus, rail, road or tube. These provide easy access to all parts of central London but our location means it is easy to explore the rest of the UK should you wish to. There are beautiful park and river walks near us and you can walk to either Barnes or Putney for a fabulous selection of bars and restaurants. 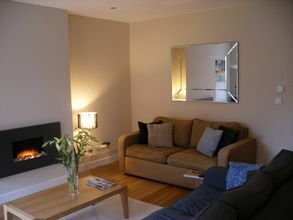 See the full home exchange offer and more photos, HE20071. The internet has certainly made it much quicker and cheaper to view home exchange listings before joining, then join and immediately be able to start contacting other members with your exchange offer. Email is definitely a great improvement over the pricey packages of exchange offer information that used to be sent by mail. One downside of the internet, of course, is the plethora of often confusing information now available - it does, ironically, take increasingly more time to sift through this to find reliable and trustworthy sites. Home swappers have always tended to be independent travellers but it is the case that the internet has made it easier for more travellers to feel confident about putting together their own travel packages, from flights to accommodation and car hire, and thus, many who may have been daunted by the idea of making their own home exchange arrangements in the past, are no longer put off by this. In fact, the pre-exchange arrangements, when home exchangers are getting to know each other, are often part of the fun of a trip. Allowing Use of a Computer/Internet Access by Home Exchange Partners: Any Potential Problems? Q: I notice that many Home Base Holidays members are now offering internet access through computers based in their properties available for home exchange. Have any members reported problems doing this? I'm not sure what the legal situation would be if anyone (for example) downloaded illegal material using a member's computer. Regards, Ian, Chichester, UK (listing HE19124). A: You have raised an interesting and important issue which, to be honest, is one I hadn't thought of before. We have never had any reports from members of problems arising as a result of allowing use of their computers by home exchange guests. Some members, especially those using home computers for private business, won't allow use of their computers but, as most exchangers probably now expect to have at least limited use of a computer with internet access, this is increasingly offered as part of an exchange as you noted. Without looking into this further, I don't know what the legal position would be (and this is likely to vary depending on the country) if it was discovered that a home exchanger's computer had been used to download illegal material. Although the computer owner must ultimately be responsible for how it is used, it would seem easy enough to prove (through flight tickets, etc) that any illegal material found on a computer would have been downloaded during a period when the owner/their family was not at home. Although by the time an exchange takes place, most members will feel very comfortable with having their exchange partners stay in their homes, and use all their household equipment, this is still an important issue to consider. If you have had a home swap that included use of a computer for internet access in your home, have you addressed this issue that Ian has raised? Or have you limited the use of your computer in any way? Your experiences and feedback are welcomed, either by email or by leaving a comment on this post.